These lyrics have been rolling around inside of me for days now. Probably about a week. I'm not really sure why. My only conclusion is that these words really are the cry of my heart. 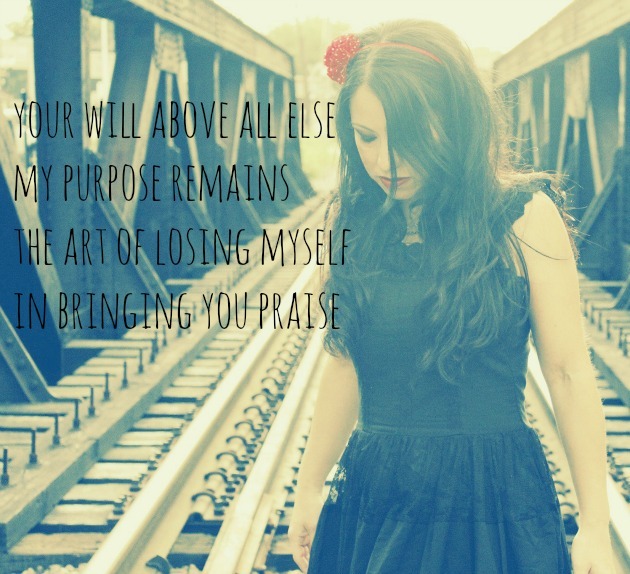 I want to lose myself in my love for God and his love for me. I want everything I do to be an inward and outward act of praise. I am so completely in love with Jesus. and it inspires me to love others with His kind of love. A huge huge thanks to Brooke for introducing me to this cover of this song. always have loved this song. its so beautiful. to live life with this as the cry of hearts, every day, is what I hope we, as believers pursue. i love everything about this song. it really is the cry of our hearts to live for Him, to be used by Him. This song is one of my favorites! So encouraging and makes me want to praise God more and more. This is probably one of my favorite songs. Its a beautiful reminder that the Lord changes us from the inside out, that his love never fails and although we may be weak he is strong. HU has awesome songs with beautiful lyrics! Have you heard the Fox & The Hounds' version? (You can see it here: http://www.youtube.com/watch?v=jRErw9DZ0hU&feature=share&list=UU2cxi2jaI1FGeOBvF9T159g) I love this song so much. P.s. LOVE the photo today!